I named this easy romper Salina. In Spanish, the name means “salt pan”. You'll understand why in a minute and if you have ever seen a salt pan, like the ones out in the desert in the western US. Many years ago, I visited Etosha National Park in Namibia famous for its wide open views of the salt pans and amazing wild animals. 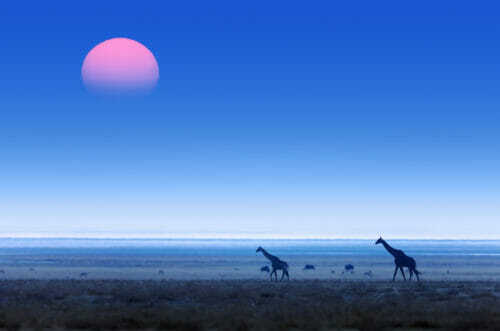 I vividly remember seeing the long, thin silhouettes of elegant giraffes. They seemed like mirages like they were almost not even there. The lines and the shapes made them look narrower than they were. The design of this easy romper does the same thing and makes me look narrower than I really am, and I like the optical illusion. Believe me, at “5 feet nothing” I take all the help I can get. I wished I brought this romper with me while on vacation recently. The truth is I forgot it pinned to the mannequin. I also forgot the step-by-step pictures for the tutorials I was supposed to share with you 4 weeks ago. I am forever packing at the last minute and for the first time in my life I ended up with more clothes that I needed. The wrong kind, unfortunately… To my surprise, I found myself wearing clothes a tad too fancy for walking miles under the blazing Tuscan sun –all because of my expanding waistline and the good food of Italy rendered the rest of my wardrobe unusable. Oh, how I wished I had my little “mirage” with me. So comfortable, versatile and slimming (my kind of diet..). So just in case you are in my shoes, join me in this optical illusion. This easy romper is suitable for adults and teens. It has a flounce that hides the tummy and the use of a bra becomes optional. Please print in landscape mode. Because I made this pattern compatible with one way stretch knits the seam allowance is 3/8″. No buttons or zippers are needed. All the pieces of the top are to be placed on the fold. Before you decide on what fabric to purchase, please print the pattern and take all your pieces to the shop to make sure you have enough fabric. I highly recommend the use of natural fiber fabrics when possible such as challis (also known as rayon is man made but from wood cellulose fibers), soft cotton or cotton knits, cotton silk. A drape and soft look is ideal. light fusible interfacing for the straps, optional. I use Thermoweb. You can download the pattern for Salina The Easy Romper from our account at Craftsy. The girl in the picture is wearing a size 6 but she is actually size 4. This romper will look best on an hourglass, triangle, and a narrow rectangle figure, this is, of course, only my opinion. The measurements below correspond to the romper without the elastic, they are the maximum width of the item. See next page for further instructions. I am having trouble underatanding at what point ai attach tbe back of the top? I am not understanding the instructions. Also, when cutting out the front top, do I cut out the triangle bit (dart) or leave it and use it as a guide to fold fabric for the dart? Hi Anita, you are supposed to joining the triangle and sew the tip. Maybe you should wait for the video. 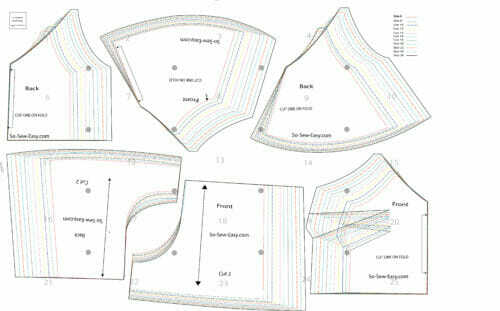 The instructions are step by step but if you have never made a garment this might be a little advance for you at this point. I figured out the darts and have made a few garments but I am also stuck on the part where you attach the straps to the romper top and then the flounce. 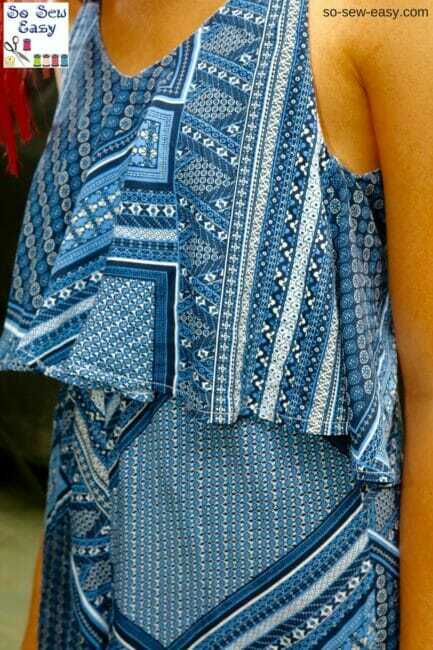 Do I have to have the romper inside out at this point or just normal and pin the straps to the inside? I am waiting for the video but do you have any idea when you might upload it? I would love to finish the romper soon as it is a lovely garment. Hi Anita yes you need to sew the straps inside out however this is better explained on a video. doing my best to finish it. Hi Sherrie, not at the moment, I am looking for an asistant to help me do this an a million other things I need to do for the site. Let you know when the PDF is printable. Use adobe reader, on Actual Size and landscape mode, as of now it is hosted on my Craftsy store, however when is is no longer free you will be able to purchased it on my Etsy shop.